A RUP LIFE: Chimpanzees for Tea! Sometimes you need a bit of silly for your day! Chimpanzees for Tea! by Jo Empson is just the book to get your fill of silliness. This book is about a little boy who is sent to the store by his mother with a list of things to shop for. Along the way he gets distracted and his list gets a little confused. For example instead of a box of rice he ends up with MICE. 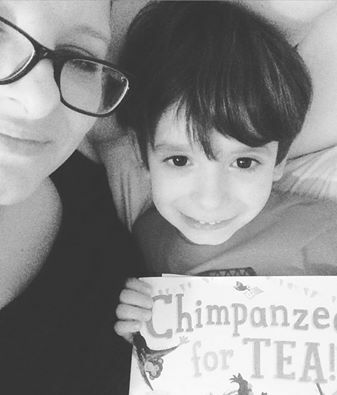 My 5 year old has been a little under the weather so cuddling up on Mom's bed was the perfect setting to read this book together. He quickly caught onto the antics of the list switching and was giggling. He especially enjoyed the ending where all the new guest ended up for tea. The illustrations which are also by Jo Empson were perfect for this book and added to the overall whimsical tale. If your looking for a book that is a truly fun read I highly recommend you check this one out! Needless to say, Vincent’s mother is in for quite a surprise. Told with a playful rhythm for reading aloud and illustrated with exuberance and great child appeal, this humorous picture book will have kids laughing and asking for repeated readings. You can purchase your copy of Chimpanzees for Tea! at your local book retailer or online at stores like Amazon. 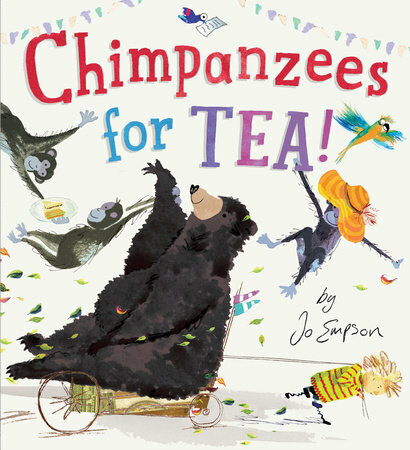 One lucky reader will win a copy of Chimpanzees for Tea!